Every year, Microsoft, Google and all the big names tech make advancements in securing the internet and protecting people’s privacy. They are continually rolling out new features aimed at improving browser security. One of the biggest updates we’ve seen is included in the newest release of Google’s web browser Chrome. 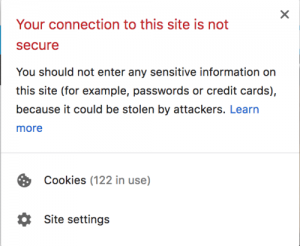 Google is now marking all website connections “not secure” if the site doesn’t operate on a HTTPS connection. This is particularly important when entering any type of personal data, like credit card info, but is overall good for the health of internet security…. HOW DOES THIS AFFECT YOUR SITE? If your website operates on HTTP, you’ve been missing out on traffic by ranking lower in Google’s search engine results. With Google rolling out the warning on the world’s most popular web browser (60% of users surf the web with Chrome) visitors are sure to skip your site once it’s labeled “Not Secure”. Domain Verified Certificates – This paid level of SSL certificate verifies your domain and that you legally own it. You will also receive a seal of trust to use on your website. Organizational SSL Certificates – Again, you will need to prove you own your domain, but you will also need to provide proof you own your business. While more difficult to obtain, these SSL certificates boosts the trust value for your visitors, which is especially important when selling online. If you are a WordPress Managed Hosting client or use our EZWP Builder package, the SSL certificate has already been taken care of for you by KartHost™. For our self managed hosting clients, it’s easy to do it yourself, just follow the tutorial above or contact us if you need help.